In the outdoor area at the IAA, a pre-series vehicle from Knorr-Bremse demonstrated what an autonomous vehicle is already capable of today. 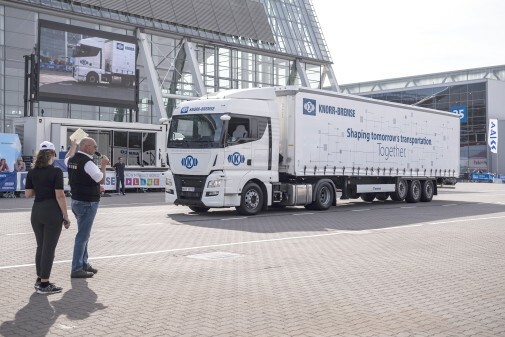 Driving fully autonomously, the truck combined the Autonomous-Yard-Maneuvering solution first presented by Knorr-Bremse in 2016 with a Highway Pilot system, clearing the way for further automated freight transportation within and between individual hubs (hub-to-hub transport). The semitrailer rig featured 360-degree environment perception, providing the basis for automated evasive and overtaking maneuvers on multi-lane roads. The “fail-operational” architecture of the system as a whole ensures that the vehicle remains maneuverable even if critical components such as the steering were to fail. 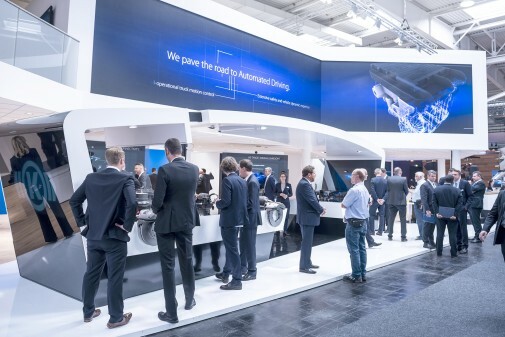 The New Mobility World live arena in Hanover hosted demonstrations of both automated evasive action and overtaking maneuvers, as well as of the back-up role of the braking system in the event of a steering system failure. With the steering deactivated, the truck steered round an obstacle by selectively braking individual wheels and continued smoothly on its way. With a combination of the latest system components, big touchscreens and interactive 3D animations, Knorr-Bremse set a benchmark at the IAA. One star location here was the pavilion in the outdoor area, where the focus was on the trailer and aftermarket sectors in line with the motto “The Trailer Experience – featuring TruckServices“. 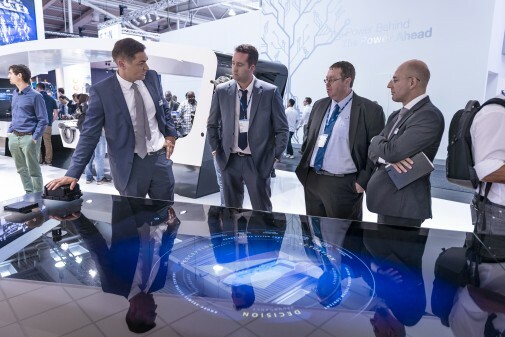 Visitors were able to compare three generations of trailer EBS systems, and click their way through multimedia presentations of various application scenarios. Animations provided rare insights into the hardware, while augmented reality enabled customers to dive deep into the future of trailer manufacturing.